Since she wants to abuse dogs and verbally abuse me, make this public, SHARE IT. Share it with everyone. 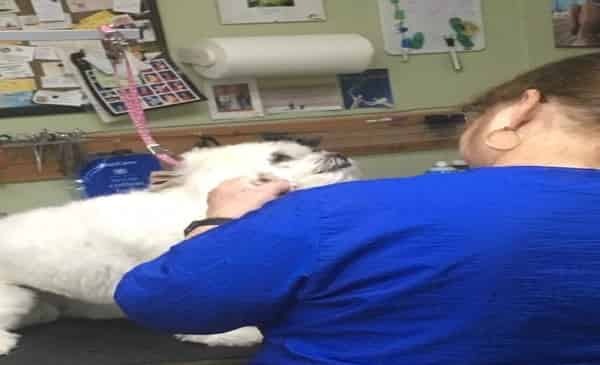 This is what this horrible woman does every day to every dog. She even broke a dog's jaw two weeks ago (the police have the evidence), it was reported to sheriff department. Left with the broken jaw and bruised chest. And this dog was a perfectly well behaved dog. There was no need for this. You can't make claims and need video as evidence, hence this. She picked the dog up by the neck and shook it and slammed it on the table. Her name is Phylis Luca, she's the owner, of the Happy Puppy Pet Spa. And She called me threatening me a little bit ago and cussed me out. And lie from her saying I did the dog is false. The video is the proof. And I quit today. WARNING: THERE MAY BE A TRIGGER FOR ANGER. WATCH AT OWN DISCRETION. UPDATE: YOU HAVE TO HAVE EVIDENCE TO PROSECUTE. HENCE THE VIDEO. I HAD TO REMAIN NON CONFRONTATIONAL TO BE SUCCESSFUL. POLICE HAVE BEEN NOTIFIED. Speak Up! please share this story on Facebook or Twitter. SHARE IT. Share it with everyone. This is what this horrible woman does every day to every dog. 3 Responses to "She picked the dog up by the neck and shook it and slammed it on the table"
Are the dogs in this story ok??? Please tell me they are ok.
What city and state is this? I hope she is prissy! Personally I wish abusers would receive the death penalty!